When I think of a whiteboard, I usually think of a classroom. Or an office. Which is why, when my kids first said they wanted whiteboards in their rooms, I wasn’t thrilled. I have to admit, I’m big on things matching, and I liked the cloth bulletin boards filled with cute pictures they already had above their beds (the only place on their walls a big whiteboard would fit). I didn’t think whiteboards would quite “go with the décor”. But, remembering how much fun I had drawing and coloring on them growing up, I got over it and bought them for my kids. It was one of the best things I ever did. 1. Whiteboards encourage teamwork and interaction. To see my kids sitting together, drawing pictures like these and playing games is awesome. And it sure beats TV. Some things are hard to say, but not as hard to write. There have been times that our kids have wanted to tell us something, but instead of saying it–maybe because it’s embarrassing or uncomfortable–they’ve asked if they can write it. How awesome that they have this alternative right next to their bed, which is where most of these conversations take place. 3. Whiteboards are awesome for teaching. My husband uses the whiteboard to show the kids soccer plays and math problems, and I use it to practice things like spelling. When we’re sitting on the bed with the kids, relaxed and talking, teaching somehow becomes an easy thing. 4. Whiteboards can provide a window into kids’ hearts. How neat to go into my kids’ rooms and find pictures and sayings like this, or little prayers and songs that they’ve written. 5. Whiteboards help parents communicate, too. Every night, I write a new note to my kids on their boards. Sometimes, it’s as simple as “I love you” or “You’re the best”. Or “Congratulations!” for a soccer goal scored, or a spelling test aced. Because, in the middle of our busy days, I might forget to tell them these things. And when I go into their rooms at night, and see their sweet faces as they sleep, I’m overwhelmed with the love I have for them. And that’s something I want them to know. That’s something I want them to wake up to. So if it takes a big ol’ white board smack in the middle of their wall to help me remind them, I’m all for it. Whether it goes with the décor or not. You just convinced me NOT to be matchy, matchy! I love this idea so much and just wrote ‘buy 2 whiteboards” on my to do list. Thank you. Okay.. how about.. white board wallpaper? eh? huh? eh? love it great post My kids love to draw and write, it is such a blessing in so many ways – much more important that the decor! Great idea Mom! I love it and my have to institute it with my oldest. The little ones are going to have to wait. We already had a run in with the white board markers. My kids have always loved white board drawing also, even our 2 year old; my kindergartner even uses a small one for spelling word practice.A tip though for when they inevitably try them out on the walls, just remember the mr. clean magic eraser is your pal.And… even though they smell strong, contrary to popular belief, they can’t get high sniffing them.BTW, welcome to reddit.com! oh how i love this idea. i have one on my fridge but putting them in their rooms for little notes is awesome! i’m always wishing i was better at notes in their lunch boxes….this idea will work better for me. loved it! I enjoy using an Aquadoodle with my nephew — we got one that just sticks to the wall, and we draw pictures back and forth. And it cleans itself up. But he also really like whiteboards — especially at a young age (he’s 2.5) a dry-erase marker is easier to manipulate than most other drawing implements.After a quick google I notice Crayola makes a washable dry-erase marker. Nice! What an awesome idea to put them in the bedrooms! I want to try that, too! We and easel whiteboard downstairs in a corner but they just use it to hide behind.Now if I could just get my 3 year old to quit drawing all over herself whenever she gets a hold of a marker…. those are great! It is funny how once we become parents we learn to like things that bring our kids happiness. There are things I said I would never allow but boy have I learned to never say never. brilliant! I’m totally going to pass this idea along! I Love It!!! It sounds like it helps everyone… great idea, and very colorful! I love this idea! My kids might be alittle young for it right now (I would be afraid they would move right off the white board onto the walls), but in a year or two – we are there! We have a white board in our kitchen. The kids love to write or draw on it. Right now it says Happy Birthday. R7 will be 8 next week! Very sweet post and fun. We had a white board emergency of sorts today. My daughter decided to use her markers on the floor and the white fridge. She should know better, but …anyway. I learned that dry erase markers can stain non dry erase surfaces. However, I also learned that using a brillo pad ever so gently on those non dry erase spaces saves the day. Genny, we really enjoyed the pictures of their work! What a fun idea to share and pass on! I am also vey picky about decor, but you just convinced me how great of an idea these are. I LOVE it and love the 99.7% how cute is that? I bet that made your heart skip a beat. Very cute thanks for the idea!! That is such a cute idea! I love the 99.7 percent that is too funny! I might need to pick up some whiteboards great idea. Wonderful post. Great idea. Really got me thinking! Thanks. Ok, Ok, I’m heading out to get me some whiteboards .What a neat idea! This is absolutely true (and expertly explained!) I’ve written about white boards a lot. Who would think they’re such an excellent tool? 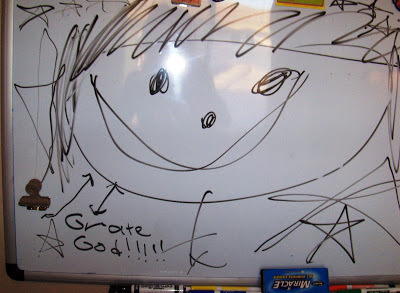 Here was a fun conversation I had with my daughter last year on the white board: Snot Stew. What a cool idea! My daughter also writes on her mirror with a washable overhead marker pen – which keeps me in tune with what’s going on in her 13 year old head…..
What a great idea! Mine aren’t big enough to read yet, but maybe my little one can draw on the white board instead of the table, the closet doors, himself…. Love this! We are big into writing notes and text messages to each other in our home. 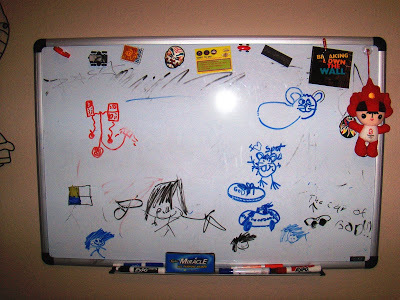 I think whiteboards would be a great addition with my teens. Thanks for the super idea! What an AWESOME idea! I’ll remember that for when my little ones are a little bit older! What a great idea. I will add this to my shopping list too. My boys are just starting to write. What a tool this will be. I can’t wait to receive the cute “letters” like the 97% note you received. Thanks for sharing this. I love this!! I’m with you on the matching thing – but I have definitely been persuaded to be otherwise. Although, white is THE perfect accent colour!! I love this idea as well! Very preious and priceless!I think I will add 2 boards to my list also! Thanks for sharing this! This nearly brought tears to my eyes! What a wonderful thing! I will have to file this one away for when we have kids. ♡ What a great idea! Hi, 1st time here. You are a mom-genius for doing this. I wish I had thought of it when my kids were younger. I love, love this idea. You know you can by whiteboard paint at your local home supply store, too? I purchased some for my daughter’s play room a while back, but haven’t had a chance to paint it yet. I really liked your #5. I watched a series by Donna Otto, and she hangs a whiteboard in her garage (I think) with a message for her husband to see when he comes home from work. She also uses one in another visible area in her home that she writes messages to visitors or family members.Thanks for the great ideas on how to use it! This is a great idea. Thanks for stopping by my blog. I’m enjoying yours. Now I know what to purchase when we get into a house hopefully next year … you and your kids are brilliant! 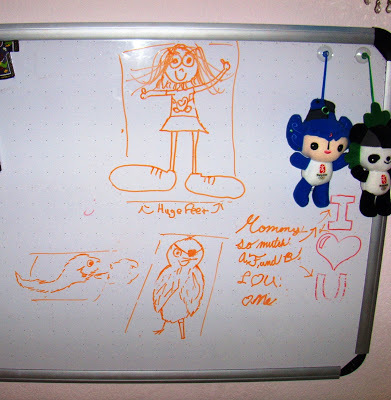 Love the messages…especially the one from your daughter…I must run to Target and get me a whiteboard. What a wonderful idea! Especially writing them a note each evening for them to wake up to. Definitely on my list of traditions to start, now. Wow, Well who doesn’t want a whiteboard now? 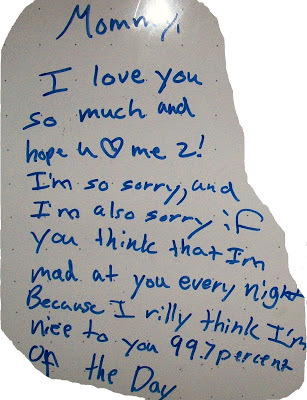 I want someone to put a white board over MY bed and leave me sweet love notes to find before I go to sleep. How lovely. I don’t think I ever commented here, but I stumbled this post I loved it so much! :)Thanks! I love this idea. I’m going to have to bring our whiteboard down to their level, since I never use it. Now it will be our family’s whiteboard. Great tips. Genny, what an awesome idea…I have at least four white boards left over form my home school journey that will work fine! I use the whiteboard for my urgent to do list; when that is not working to get things done, I let my son draw on it. When we homeschooled years ago, my daughters used them all the time for projects and math problems. The visual gives learning a different perspective. My kids do not like me telling them what jobs they have to do so, I write it on the marker board so there is no conflict. Weird because I am still telling them what to do! Due to spam that I keep receiving on this post, I am closing it to comments. Sorry!